This is the first of a few articles writing up my experiences regarding running games at this year’s DexCon 2013. The reason this one convention is broken down into several articles? My team ran three LARPs this year. That’s right, we took on the monumental task of working on three games at once over the last few months and presented those games within a single twenty-four hour period. It was an exhausting, exhilarating experience and I’m going to break it down from my perspective in my post-convention recovery period. (And there is a recovery – I am one exhausted game designer). Please note: this post is meant to be as extensive a documentation of the game from a design perspective as I can get. When possible, pictures and other evidence of design are included. All photos unless otherwise indicated were taken by Matt Yanega or me, Shoshana Kessock. The Premise: Tales of the Rising Star was an ambitious idea inspired by the amazing work done by the Monitor Celestra team overseas and fantastic full-immersion games like PST Productions Terrorwerks. 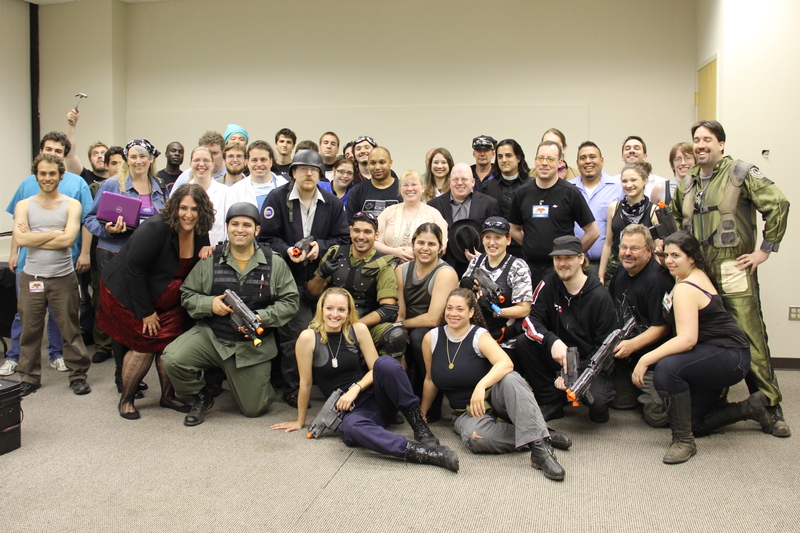 The notion was trying to design a convention game inside the confines of a ballroom setting that would harken to the Celestra’s immersive atmosphere through prop-building and a focus on more freeform roleplaying styles. Players would get the chance to play one of five groups of characters aboard the Rising Star, a medical ship in the Colonial Fleet, as it escapes from the devastating nuclear attack on the Twelve Colonies of Kobol. Officers, Marines, Engineers, Medical Officers, Scientists and Civilians would work together to keep the ship from being destroyed as they dodged Cylon ships, tricky jumps, and of course internal pressure as they try to decide if they’ll join the ragtag fleet of Commander Adama or go their own way. The Preparation: The game preparation began months before DexCon between myself and the team. We realized that this was a game on a scope that was new to almost all of us: a seventy person game with more prop building and system development than we had handled before. Most of us were used to dealing with games that either a) had lower physical build, b) less players or c) an already established game system. As it was, we were creating a great deal of set design for the game for a max of 75 players and were building an entirely new system to boot. So we broke down the portions of the design, split the work load, and rolled into production. 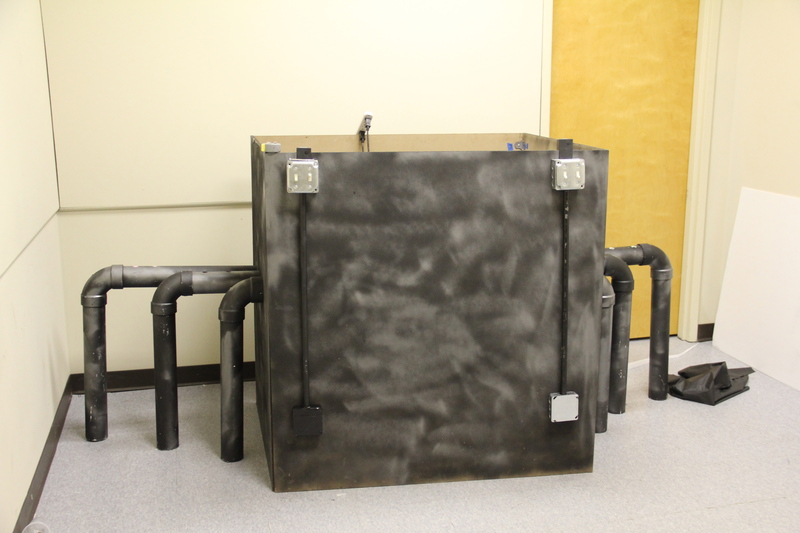 Build-wise, Mike and his team spent 20+ hour weeks building a nice sized engine prop with working lights and switches for the Engineers, painted nerf guns for use and designed simple mechanisms like cat litter buckets to hide items in. At the same time he coordinated with Abigail Corfman, our computer technical director, who created an interactive DRADIS system to detect Cylons, as well as a system to show characters how much fuel, oxygen and power the ship had. This system was controlled by Abigail herself during the game, hidden behind a screen where she could directly respond to things like jump coordinates that were input into the system. On the game mechanics side, John Adamus worked with Mike Maleki and Josh Harrison to create the actual system. It drew upon the idea that we wanted the game to be very role-play heavy versus skill-check focused. To that end, all players had three stats to differentiate their strengths and weaknesses from one another. They also had two professions that gave them special abilities they could call upon during game. All challenges were time based. A character would need to stay and repair or heal or calculate for a certain amount of time to accomplish their task, where abilities could cut down on time to use their skills. The currency of the game was Mental Energy (ME) that was expended to do tasks. Items in game, such as drinks or food could bring back Mental Energy. So could spending time with Civilians, which kept them integral to more technical characters. That, then, was pretty much it – the system was meant to support a simple ‘yes, and-‘ improvisational role-play model that encouraged players to support and carry along the story with their actions. This system development was extensive, going through nine drafts before it was codified. 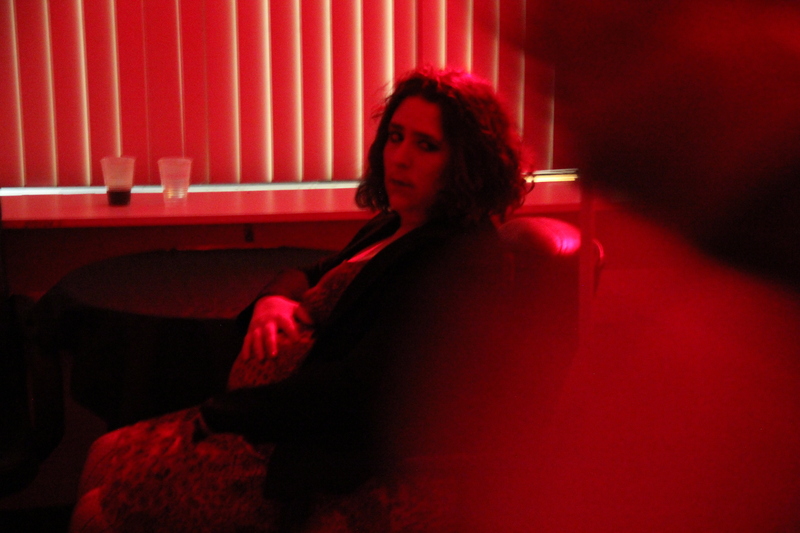 Storyteller Ericka Skirpan in character as the pregnant Minister of Health and rival for Laura Roslin’s presidency. Then came the characters. We were creating pre-generated characters for all the players, which meant that there had to be 75 individual characters created and available to players. In the past, I had focused on writing extensive backstories for players that interwove them not only into the plot but into each other’s backstories. However with a group this large, that amount of writing for one person would be prohibitive. Instead, we chose to focus on creating short but concise backstories that included: a) a few lines regarding the characters backstory, b) personality traits and c) how they reached the Rising Star in the wake of the Cylon attack. Then we looked at the colonies themselves as inspiration for ways to give roleplaying hints to players. Each character was told their colony and given some suggestions as to the stereotypes for that colony. Additionally we integrated a mechanic I heard about from the Monitor Celestra team, which were roleplaying suggestions at the bottom of a character sheet. For example, a Raptor pilot who had lost his whole family on Picon might be ‘a burnt out stim jockey looking for his next score’, or else ‘a haunted survivor intent to help out his fellow crew’. We provided three options and let players take inspirations from these ‘might be’ hints, giving them the agency to select their own character motivations and goals. The characters were also split up between their profession groups – Civilian, Officers, Marines, Engineers, Scientists, Medical- and each section was assigned to a storyteller. That storyteller was responsible for not only writing the characters but organizing their backstory ties to other characters, as well as taking charge of the plot lines that would be seeded into each of the groups. Puzzles, challenges and plot goals were designed by each of these storytellers. So we went. And we wrote. And we built. And printed sheets again and again. And finally we came to game. The Game: Right off the bat there were challenges. First, massive printer snafus caused paperwork mayhem at game check-in. Characters that were assigned were not where they were supposed to be. Then came the build. It began at noon with the build team going straight on until right before game on at 6PM. At six, we gathered the players outside in the hallway in their self-selected profession group and gave them a chance to look over their sheets. Then at 6:30 came the system briefing. Just before 7PM we went in character and so it all began. The Civilians debate the future of the Colonial government. Players dove in to their characters with gusto. Engineers raced around the ship to keep the Rising Star flying against missile attacks, shrapnel issues, and various failures and shortages. The bridge crew stayed at their stations and monitored situations thrown at them by Abigail, as well as monitoring communications with other ships (including guest communications from ships left behind by the Galactica due to no FTL and a discussion over the comms with Colonial One towards the end). The Marines secured the halls and lead sortees into space depots where they encountered toasters (of course) that shot them all to hell. The Civilians politicked in the bar while dealing with a mysterious illness that the Scientists and Medics had to try and counteract, or else see the entire ship wiped out by illness. 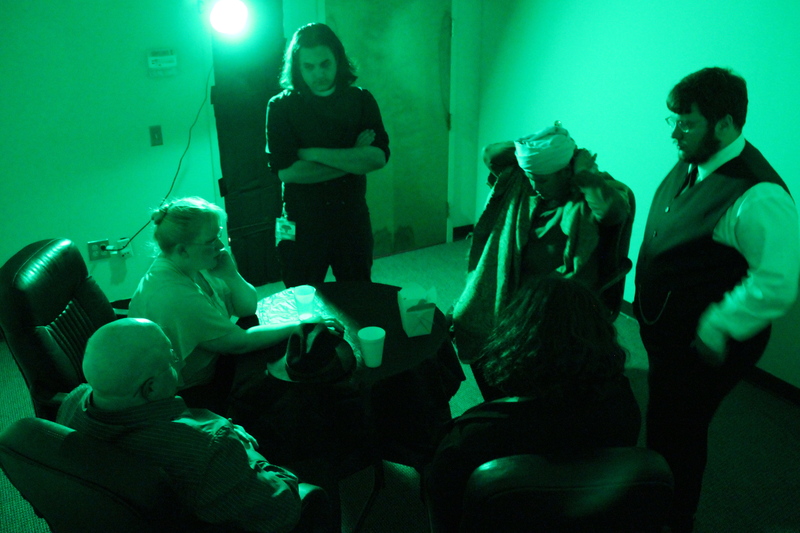 Meanwhile, storytellers and out of character techs for the game moved around the space wearing white masks. Players were instructed that if they saw anyone in a white mask, they were invisible… Until they touched a player on the shoulder. At that point the player would be able to see and hear everything they said. This was inspired of course by the Cylon projections in the series, specifically the proclivity of the Six Cylon to touch Baltar on the shoulder. This technique for play was inspired (nay, nearly lifted directly) from one used in the Monitor Celestra game in which staff wearing red would do exactly the same thing. Cylon projections spent their time poking at the buttons built into the characters and helping provoke, terrify and inspire them. A Virgon reporter getting her foot shot off for trying to make a run past the Marines to confront the Captain. A lost Viper pilot lands aboard the ship and finds himself unsure if he’s hallucinating or receiving visions. An opportunistic Engineer decides to frak stealing supplies and instead saves his commanding officer, throwing him over his shoulder as he escaped a Cylon attack aboard a supply depot. A Priest of the Lords of Kobol begins receiving visitations from an apparition that promises to lead him to the One True God, and throws him into a crisis of faith under a hail of nuclear missiles. A lone engineer braves a decompressing airlock to help repair the ship, only to be accidentally vented into space when her crew vents a discovered Cylon device without checking if the airlock is empty first. Her inconsolable brother tries to get the captain to send a Raptor out to get her body, but is refused. Despondent over the loss, he chooses to commit suicide out of the very same airlock. The civilians decide that they do not accept Roslin’s ascension to the Presidency and decide to challenge it based on their own delegates aboard. The discussion of whether they were committing a military coup against Roslin was put on hold as a base star appeared and they joined to Ragnar Anchorage to join the fleet, and potentially a very tense political situation. As can be seen by anyone who watched BSG, the events in the game were following the miniseries plot but did not necessarily follow the canon exactly. The Rising Star is a canon ship that is mentioned in the series several times, but events aboard the ship in our game are now in the hands of the players. The game ended with the ship joining the fleet at Ragnar (or at least executing the jump to get there!) but from there, who knows what will happen? The Wins: The success of this game truly came down to the fluid storytelling style we designed for the game. The team created instances we would put into play around a looser framework of events we would throw at the players. However, for the most part the events were being written by the players themselves. The events in game are completely created by the players and whatever happens from here will be set by the characters in game. (And yes, that means that a sequel game is already in the works for next year). I would also say that the game could not have succeeded had the players not embraced the notion of cooperating to create the best story. To use a Nordic term, these players truly embraced playing to lose often. Who could have imagined a player choosing to throw himself out the airlock in despondency over his sister? That moment set the tone for the story for the evening and drove home the sadness of Battlestar so hard, all because a player chose to let himself (and his character) go. The Not-So-Wins: Every game has its issues and this one did as well. One thing we discovered was the difficulty of integrating the profession groups together within the game play. The military, of course, was interested in locking down their ship and keeping the non-military characters isolated. That lead to a number of characters trapped inside either the ward room (which became the bar very quickly) and the medical bay. While some players were able to talk their way out into the rest of the ship, that left a number of people left inside one room or another for a large part of the game. It took a more active player to get themselves out into the rest of the plot, and some frustration was felt by players who didn’t know what was going on because of their isolation. This came down to a mix of the profession set up and the proficiency of the military characters at locking down the ship, but it was definitely something the team looked at for the future. Then there were the technical issues. We had aimed large for the game and had lots of issues with our build, from lights that didn’t always work correctly, expensive lighting bulbs that broke in transit, speakers that shorted out the day before the game, and walkie-talkies for an intercom system that were unusable days before. We won’t even get into the printing and paperwork problems brought on by a complete failure of Staples to print things correctly. All were logistical issues behind the scenes that gave us roadblocks. In the end, myself and Mike Maleki as team heads agreed that we would have to scale back from what we originally intended based upon one simple problem: economic constraints. The Final Analysis: The game seems to have been a glorious success. Players overall responded positively both in person and online on the Facebook group. The feedback we received as well from the convention organizers said that they would like to have us back for next year, and we’ve already agreed that we’ll probably continue the story of the Rising Star. We have some technical and storytelling lessons we’ve learned, but now we have one year to grow our design. For now, however, we get to sit back with a glass raised to a great bunch of frakin’ players, the games that inspired us before (all hail the Monitor Celestra and her amazing team! ), the convention that hosted us, and the people that came together to make this happen. So Say We All! It was a blast playing the game and we were all on such a high afterwards we didn’t get to sleep until morning plus our team of Sons of Ares Marines were so on point. And cudos to Eagle for the shot that took down the frakking reporter! He got a field promotion for that! You all did an outstanding job. The errors where invisible in the third row, so they really didnt matter, and the effort and energy was easy to see in everything. I will say it over and over kudos to cast and crew. I will volunteer some time to help with some build and tech, I am an old stage hand. I am right now trying to figure our how to safely make a plexi lit tactical wall that will transport much small then constructed, I’ll get back to you when I have figure dit out. It sounds magnificent. Thanks for your work, and especially for sharing your thoughts, Shoshana.